With the Wales Office’s move to GOV.UK imminent, we’ve been working on the ability to translate various bits of content across Inside Gov into Welsh. So far, we’ve added support to translate any news article, speech, case study or publication document into Welsh (or indeed any of the other 44 languages we’re already supporting for the forthcoming Worldwide section). To do so, first create and save the document in English and then click on the ‘translations’ tab to add a translated version. It’s also now possible to translate an organisation’s homepage and about page into Welsh. (We don’t expect anybody other than Wales Office to make use of this feature, and you should contact us if you want to know more about it). 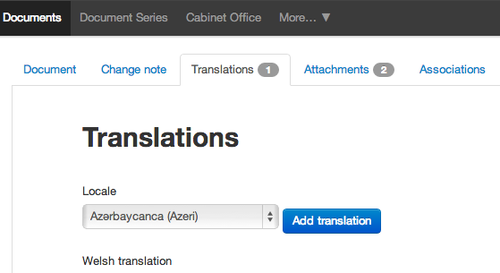 Coming soon we will also be adding the ability to translate corporate information pages on organisations. We expect that every organisation will use this to provide a Welsh version of their Welsh Language Scheme. (Note: It is currently not possible translate detailed guides, consultations, statistical data sets or fatailty notices; nor is there a story on our backlog to support that. If you have a need for translations of these document types, please tell us). What does the law actually say regarding translating docs from a public body into Welsh for internal consumption only? I know we have to because we want to. But, when faced with a technical difficulty (translator off), am I breaking the law if I publish a document for internal consumption (staff only) in English only, followed by its translation a month after (as an exception, not a rule) into Welsh? Thanks for your message. If your organisation has a Welsh Language Scheme, this should be your primary guide as to what to translate and when. I'm afraid we can't really advise on your individual Welsh publishing obligations. Thanks Neil, at Rural Payments Agency we administer schemes that cover Wales therefore we need to publish content in Welsh. We curently provide a version of content (web pages, guidance booklets, statistical data sets) in English and a version in Welsh. Can you clarify what impact your note at the bottom of the blog will have on RPA please? Hi Joanne, thanks for your message. It's difficult to say exactly what our approach would be without knowing more about your existing content, and the needs of your users. If you have a GOV.UK transition manager, perhaps you could raise the issue with them in the first place? (we're happy to provide contacts if you don't yet have one). Is it possible to have Welsh HTML publications or not? I'm not clear from the 'note' above.